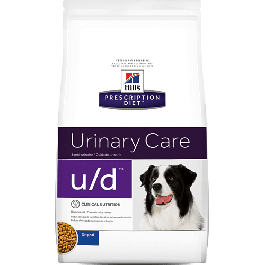 Hill's Prescription Diet u/d Canine ensures your dog has the right balance of minerals, which discourage the formation of crystals that can lead to the creation of bladder stones. This food is recommended for dissolution of urate and cystine uroliths, reduction of urate, oxalate and cystine uroliths formation, advanced chronic kidney disease (IRIS stage 4) and hepatic copper storage disease. Reduced protein, calcium and nucleic acids - decreases urinary concentration of constituents of urate, oxalate and cystine uroliths. Maintaining alkaline pH 7.1-7.7 - discourages formation and aggregation of non-struvite crystals. Controlled levels of high quality, highly digestible protein - reduces accumulation of toxic protein-breakdown products. Increased non-protein calories - ensures adequate energy, avoiding protein catabolism. Reduced phosphorus - slows progression of kidney disease. Reduced sodium - helps slow progression of kidney disease and helps limit fluid retention in early cardiac disorders. Increased B complex vitamins - combats increased urinary losses due to polyuria. Reduced cooper - avoids copper toxicity due to defective elimination of copper by the liver. High vitamin E and beta-carotene - neutralises free radicals to help combat urolithiasis. 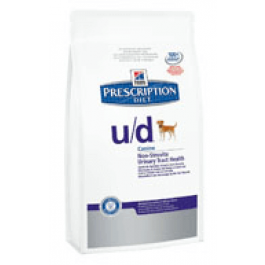 Hill's Prescription Diet u/d Canine should be recommended by your veterinary surgeon. For detailed information on feeding amounts and how this food can help your pet, please consult your veterinary surgeon. 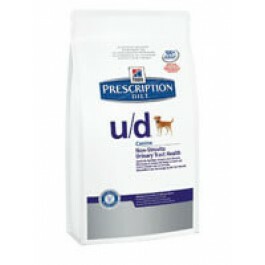 Exclusively feed the recommended Prescription Diet food and keep fresh water available at all times. These ranges are a starting point only because dogs' needs vary. Adjust the feeding amount to maintain the optimal body weight. A 370g can is equal to 125 grams of the dry food.